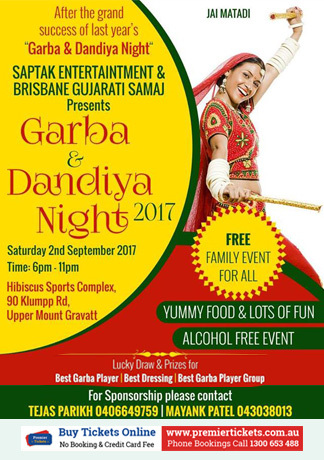 Saptak Entertainment & Brisbane Gujarati Samaj Proudly Presents Garba & Dandiya Night 2017. Register now for a delightful evening of Dandiya & Garba & celebrate full fervor! Gates will open at 5:30 pm for the 6:00 pm start. Please be there early to avoid unnecessary rush. Premier Tickets is Australia’s leading online event ticketing & marketing solution provider. We act as a channel between the event organizers and end customers helping our clients with hassle free event ticket booking, event marketing & promotion solutions. Contact us for any of your ticketing & marketing needs for Garba & Dandiya Night 2017.